1.75X1 Magnets – How Do They Allow You to Score Over all Your Nearest Competitors? 1.75 x 1 – may not be an exact square size, but they are nearly square. Magnet advertising has grown by multitudinous dimensions because it is possible to create magnets in different shapes and sizes. However, the fascination with square and rectangle magnets never ends because marketers know that people still love to read information printed over them. They still accord authenticity to information printed over square or rectangle surfaces. This is why custom magnets 1 x 1.75 still buy attention of the marketers who wish to square their business information in a best possible way. 1x 1.75 magnets offers big room for creativity. Now you may ask what sort of creativity may be attempted over a small magnet. The answer is they are perfect to print a business logo or business symbols in full color. In this crazy world, no one has time to stand and read the contents of the business flyer or the brochure that you may gift them. However, you can easily buy their attention with a logo or small slogan. In that sense, these small magnets offer big room for creativity because they allow marketers to position their logo effectively. A full color and meaningful business logo can create strong impressions on mind people may never forget it over years. They would strongly associate their brand consciousness with that logo. Many online stores stocking custom magnets in abundance offer benefits of free online design proof, free full color printing, and free art set up, which allow marketers to exercise their creativity. 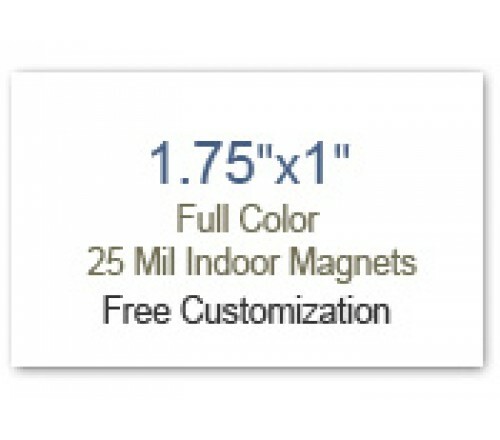 1.75 x 1 magnets are offered at cost-effective prices, which means marketers are only paying for the value that they get. A little search online will expose you to the world of online stores, which offer custom made in USA magnets in different stock sizes – 20 MIL, 25 MIL and 30 MIL. You are paying the price for thickness, shelf life and sticking ability of the customized magnet. You can save on efforts by investing in small magnets because they can do the straight talk by highlighting your business logo. In addition, you don’t have to bother about splurging on investments because most online stores offer great best buy pricing on bulk ordering. Being lightweight, you can easily manage them within your backpack or even mail it to your customers directly. If you thought, winning over a nearest competitor is going to be difficult, feel free to work with these customized magnets 1x 1.75 magnets and see the difference it makes.